A project to restore a Cold War bomber to the skies has been saved thanks to a mystery donor. A team of engineers has been restoring the Vulcan bomber at Bruntingthorpe in Leicestershire for nine years. A £500,000 donation means the project has reached its £1.2m target needed to allow work to continue. It is hoped the aircraft will fly again as part of celebrations to mark the 25th anniversary of the Falklands conflict next year. 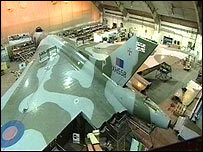 The Vulcan will roll out of its hangar for the first time in seven years on Thursday. Bill Taylor, a former pilot of the Vulcan, said: "Not only was she a beautiful aircraft as all the Vulcans were but I in fact did my first cruise solo when I got my Vulcan captaincy on that aircraft. "So, it has a special place in my heart." There are more than a dozen remaining Vulcans, which were retired from service in 1984, but the Bruntingthorpe plane is the only one with a realistic chance of flying again. It last flew from RAF Waddington near Lincoln more than a decade ago. The team of 32 engineers had already been given notice of redundancy before the latest reprieve.